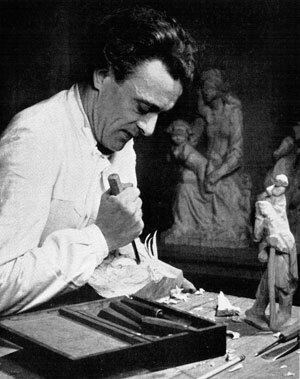 Walter Bacher, born in Brixen (south Tirol), already apprenticed to a sculptor at the age of only fourteen. Then he attended two years of art school in Munich and four additional years at the Academy of Arts. His creations are displayed in churches and museums both in Europe and overseas. One of his most famous works is the Original Walter bacher nativity scene, exclusively reproduced by ANRI in Linden wood. The Original Walter Bacher nativity comes in three sizes: 12,5cm / 5″ – 15cm / 6 1/2″ – 25cm / 10″. The smallest size is only available in plain Linden wood, the two large ones come colored. Hand carved in Linden wood – each piece is lovingly hand painted in special water colors by ANRI’s skilled artist. Click the button at the bottom of the page to browse and buy the Original Walter Bacher nativity carved out of Linden wood in our online-store.